Thanks Jas for the link. 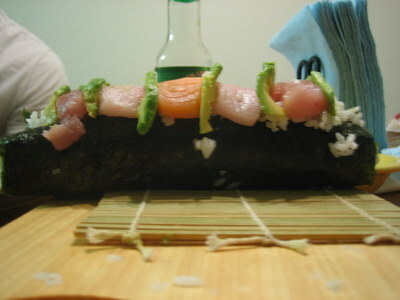 We had sushi night this past Tuesday and it was a huge success. After taking a trip down the street to Mitsuwa Japanese Market, we got a good assortment of salmon, tuna, hamachi, and albacore sashimi. We had a rough start with a few hiccups making rice and rolling our first nigiri pieces… but to everyone’s surprise, the sushi turned out pretty good, especially Bert’s Monster Roll. Here it is in all it’s glory with more pictures in my gallery.